Obama and Jim Jones Cults – The Parallels | Stop Obama Now!! 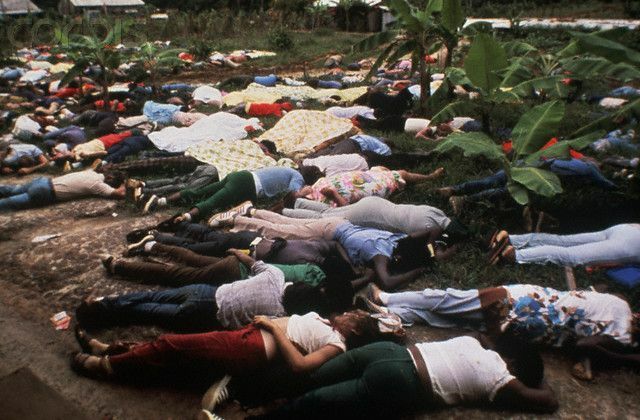 The association minister of the United Church of Christ accused Jeremiah Wright of forming a cult [Ref 1] not long after the mass suicides in 1978 of the cult followers at the Jonestown in Guyana, where about 1,000 people committed suicide or were murdered by camp guards. Wright reported this in his own book, “A Sankofa Moment.” Wright’s Trinity Church with a doctrine of Black Liberation Theology was the only church, of which Obama was ever a member and he was a member of Wright’s black nationalist sect for 20 years. 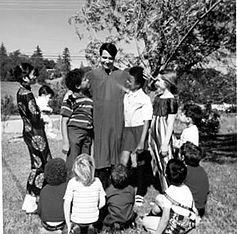 Barack Obama called Wright his “spiritual guide.” There are, in fact, a number of comparisons that can be made between Black Liberation Theology, Obama’s political movement and the Jim Jones cult movement, as follows. ● Political activism. Many do not realize that Jim Jones was very much involved in progressive politics in the San Francisco area and had national political contacts. ● Deceitful staging of events at rallies, such as women fainting and attacks by opponents, to make an impression on the crowd. Jones was a faith healer and staged many types of events, such as revelations and healings, besides followers having fainting spells. The Jim Jones cult had a death wish and the Obama movement has a collective, national death wish. That is, they would destroy (fundamentally change) America, as we have known it, if given a good opportunity to do so. You can observe many of these parallels to the Jim Jones cult in this documentary below. One big difference is that the news media still did honest investigations at the time of the Jim Jones cult and today the news media is as a whole one of the biggest supporters of – and apologists for the Obama movement. Obama’s childhood mentor in Hawaii, Frank Marshal Davis was a follower of Paul Robeson [Ref 2], an early black messiah figure, and Jim Jones was also connected to Paul Robeson. [Ref 3] Jim Jones was investigated by the House Un-American Activities Committee, because he associated with Paul Robeson, a communist fellow traveler and black nationalist. Robeson was asked in 1948 to be the vice presidential candidate by the founder of the New Progressive Party, the occultist and communist sympathizer, Henry Wallace. Wallace was a FDR cabinet member and vice-president, who was primarily responsible for convincing Franklin Roosevelt to put the “New World Order” (NWO) symbolism on the dollar bill. He dropped out of the 1948 presidential race after the relationship with his Rasputin-like occult guru in Russia (Nicholas Roerich) was made public. 1. A Sankofa Moment: The History of Trinity United Church of Christ by Jeremiah Wright, Jr.
All those with a cult-leader mentality have parallels, but the connection between Jones and Obama is the singer, Paul Robeson, and the occultist, Henry Wallace. They tried to make Robeson the black messiah in the 1940’s. He was the mentor of Obama’s mentor, Frank Marshall Davis, the communist organizer. Though he was white, Jones wanted to be a messiah to blacks. Jones probably studied Black Liberation Theology, the doctrine of Obama’s on church, or he studied the background, from which it came. I’m sure Frank Marshall Davis and others brought up Obama to be a black messiah. The people that unconsciously react to Obama that way is the most scary thing, because it is based on human instinct and is infectious. If such a mania catches on in a big way, it can become hard to stop. That is exactly what Obama is trying to promote. Resistance can collapse, because those that oppose it also have an instinct to keep their heads down and survive until the mania passes over. For more parallels between Obama and Jim Jones, read the 2008 article JONESTOWN, ITS PORTENT HAS ARRIVED, written by the original California investigator of Jim Jones (his investigation began nine years prior to the Jonestown massacre). Pleased to have you visit my site, Mr. Conn. Thanks for your work. Fixed your typos.